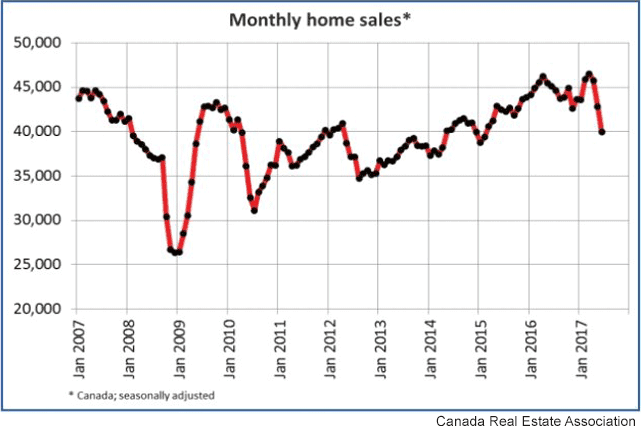 In a Nutshell: After seven years of rapid growth, the Canadian housing market showed its first signs of slowing down in June of 2017 when it suffered its worst single-month sales drop since 2010. Recent provincial and federal rules charging a 15% premium to foreign buyers has motivated many of the speculators supporting the boom to withdraw from the market. Interest rates are on the rise, but the country is heading into a buyer’s market, with a glut of available homes both in and out of the metro areas. For buyers interested in taking advantage of the availability, it’s important to engage in diligent research before leaping into a mortgage to ensure they don’t end up purchasing a home that is worth less than what they’re paying for it. For several years, the Canadian housing market seemed like a freight train that couldn’t be slowed, but recent changes to provincial and federal housing policies challenged that theory faster than expected. After home sales in Toronto bottomed out to a monthly sales volume of around 26,000 in January, 2009, the market exploded to an average of 46,500 homes sold in the same month in 2017. The boom, aided by speculators purchasing investment properties in the greater Ontario and British Columbia area, was felt throughout the country as prices rose and homes were snapped up as soon as they hit the market. In an effort to stabilize a market that was locking out many native families, the Ontario legislature followed a similar path to British Columbia and introduced a 15% foreign buyers tax, effective April 20, 2017. Almost immediately, speculators cashed in their profits and left the market. 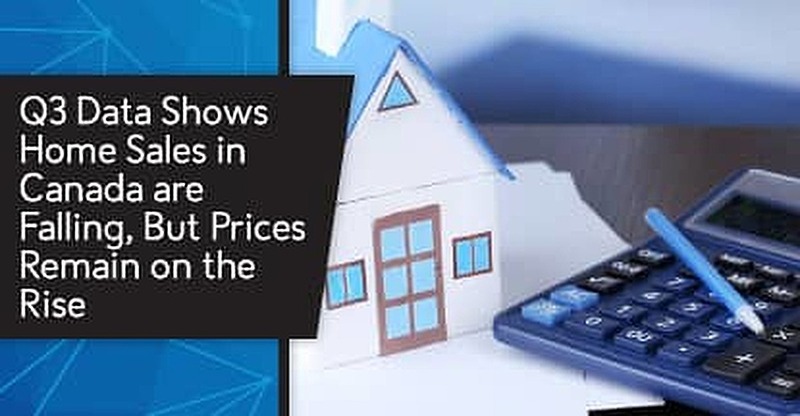 Data released last month from the Canadian Real Estate Association (CREA), showed the amount of money that exchanged hands in Toronto’s housing market in June 2017 decreased by 33.7% from the same month the previous year, dropping from $9.55 billion to $6.33 billion. Recent data showed nationwide home resales fell 6.7% in June, the largest monthly drop since 2010 — and the third straight monthly decline in sales. The relentless rise in prices since the global financial crisis of 2010 looks eerily similar to what Americans experienced during the housing bubble that grew from 2005 to 2007, which is causing some Canadian economists to draw comparisons and make warnings about potential issues with homebuyers. The problem is that a home is a leveraged asset. When you buy a home at an inflated price using a mortgage, you run the risk of owing more on the loan than the house is worth if values tumble (otherwise known as being underwater). And with CREA reporting average home values in Canada falling 10% since April, this is becoming a reality for some homeowners. Canada’s response to the dip in sales is to raise interest rates to stabilize the market for lenders, the thought being that an improved economy can handle such a jump. Mortgage rates traditionally move in harmony with the Bank of Canada rates, which rose in July and are expected to be bumped three more times by the end of next year. That increase has many shoppers who have approved mortgages at lower rates getting into the game before those rates expire. But with so many homes now available throughout the country, Canada is seemingly shifting into a buyer’s market … assuming you can get the right deal on a mortgage. If you’re in the market for a new house, the dip in home sales could work to your advantage. Despite rising interest rates, and an increase in asking price, a lack of buyers means that mortgage lenders are on the hunt for new business. Doing your homework before touring potential homes is the best way to ensure you’re getting not only the best interest rate, but favorable terms with a lender that is willing to work with you. Several research options are available online. Rate comparison websites have grown in tandem with the housing boom over the last decade, and these resources are now equipped with tools to compare and contrast more than just interest rates. Among the leaders in the Canadian market is the bookmark-worthy RateSupermarket.ca. The website offers tools to find the best rates among many lenders, as well as a payment calculator and lessons for first-time homebuyers entering the current market. Users also have the option of setting up alerts to let them know as soon as the deal they’re looking for becomes available. A recent partnership with Mogo Finance Technology allows users to search the best possible rates for conventional fixed and variable mortgages, with an eye on the overall value of each lender. 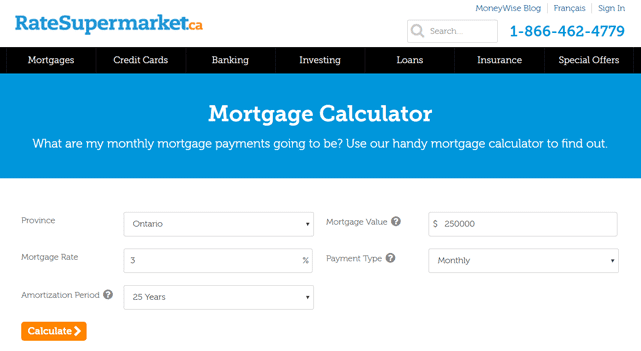 Tools on sites like RateSupermarket.ca help you compare rates and figure out how much house you can afford. These comparison websites are important tools for potential homebuyers. They allow you to monitor the ever-shifting mortgage landscape in real-time, while comparing the rates and terms of many brokers and lenders on a single screen. This transparency encourages lenders to remain competitive or risk losing valuable customers in a tricky market. Although much of the attention on Canadian housing tends to focus on Toronto — the nation’s largest city, with more than 5.4 million residents — the weight of the sales dip is being felt throughout the country. Vancouver, which passed a similar foreign-sales tax for housing last year, felt the first wave of the slump shortly after it was passed. But while rising prices have pushed many buyers out of the bigger cities, smaller areas on the outskirts have become destinations for homebuyers seeking value. Ontario and BC are more sensitive to rising prices and interest rates, as the affordability factor is already stretched. That means surrounding areas like Kitchener-Waterloo and the Niagara region should benefit from the exodus out of the big cities. And while a single-family home in the bigger areas reaches toward an average of $1 million, you can still find plenty of affordable housing and available jobs outside the city. The trick is finding a happy medium between location and affordability that allows you access to the things you love, while also providing value that will hold up through the life of your home ownership. Purchasing in a hot market can be difficult when it starts to cool, and home values return to where they’d normally be. Housing bubbles expand to dangerous sizes when more and more loans go underwater and the borrowers are no longer able to pay the monthly mortgage, leaving the lender on the hook. Smart shopping helps protect you from the potential burst. For most Canadians, a mortgage will be their greatest expense and biggest investment from their salary each month. A commitment of 25 or more years, especially in an uncertain market, requires a vast amount of research before making the leap. In the current trend, prices are expected to dip slightly into 2018 as fewer buyers enter the market. The frantic pace of new-home construction in bigger cities has already slowed, which should help the market stabilize over time. In the meantime, the glut of available homes should only work in favor of shoppers. Smart shoppers are using rate comparison websites to find the terms that are most advantageous to their needs. With fewer buyers, lenders are primed to give better deals to win your business. As the market’s evolution continues, and power shifts toward the new money entering the market, your dream home could be a lot closer than you think.